Pulling from traditional West African & Afro-Cuban dance styles, come join in this joyous, multi-generational dance class and celebration! Using your heart, mind, body, and breath, delve into your inner knowing to bring light and grace to any of your own barriers and move more deeply into love. This gathering combines meditation, reflection, and movement as Jennifer invites you to explore a specific weekly intention that you can use to be fully in your body and live your own heart’s calling. Your Heart’s Calling, Sacred Dance and Movement is for every body. No dance experience is needed. Wear comfortable clothing to move in*, and bring a yoga mat, blanket and/or pillows for our time in stillness and reflection. You are welcome to also bring a journal to take notes or write down your own awarenesses. *Except for occasional guidance from the facilitator, the movement portion of these sessions is non-verbal. Gift yourself with your full attention and presence. Contact improvisation is a contemporary dance form that primarily finds expression and practice through improvisational movement and following/exploring/playing through an evolving point of contact between bodies. It involves the exploration of one's body in relationship to others by using the fundamentals of sharing weight, touch, and movement awareness. Contact improv dancers come together each week to build community, play, explore, surrender to the intelligence/wisdom of the body, get a good work-out, and enjoy respectful, safe touch. While this "jam" is not a class, beginners are welcome as there are always more experienced dancers willing to explain and inform a bit. $15/class. $100 for 10 classes. Engaging intermediate level classical ballet class, begins with warm up, followed by full barre and center, and ends with stretching. Wednesdays, 7:15-8:30pm, Front Door Studio, $15/class, $60 for 5 classes. This is an Int/Adv Ballet class for teens and adults looking for a technically challenging traditional ballet class with an emphasis on movement and emotional expression and artistry through the music and steps. As a former dancer with American Ballet Theatre, with over 14 years of instructor experience, Christin has a unique perspective and style that integrates world class professional ballet training with exploration and fun! Her class is inclusive, friendly, and welcoming to all. Students must be at an intermediate level of training in order to safely execute the steps and combos presented in the class. Contemporary dance is a style of expressive dance that combines elements of several dance genres including ballet, modern and jazz. Joy of movement and unique and diverse expression is what is emphasized and encouraged in this class. 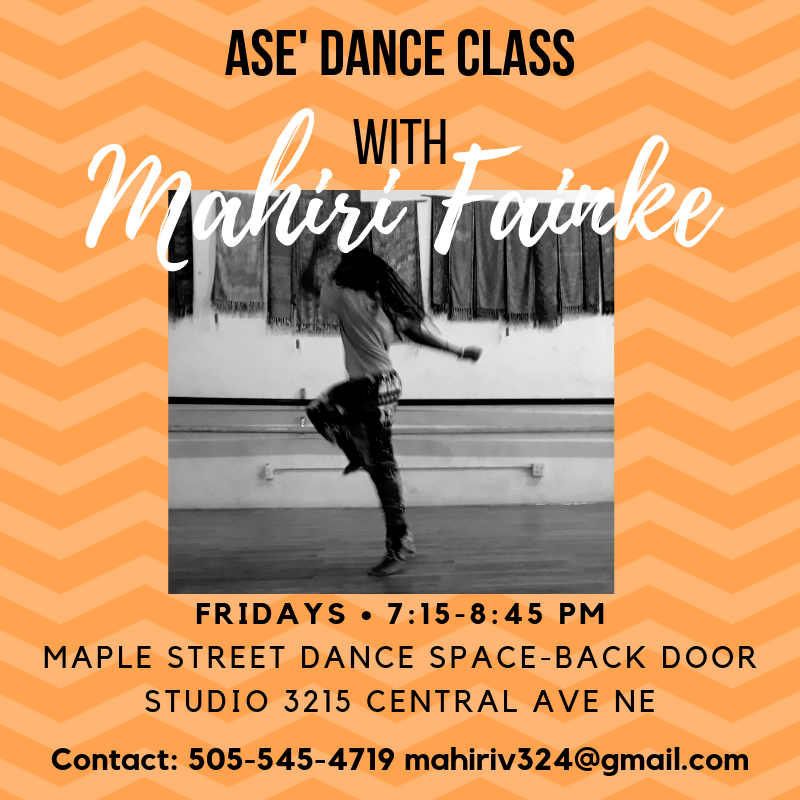 This class starts with a set warmup which is danced to contemporary music and focuses on strengthening, stretching and developing greater dance technique. Each week the warmup is the same allowing the dancers an opportunity to become more comfortable with each class. Eventually the warmup becomes part of the dance, flowing from one part to the next with fluidity and purpose. After this, the class will shift to movement progressions across the floor. The core technique of dance will be the starting point with options for advanced progressions as each dancer is ready. The class ends with a center dance combination. This is the time to let the music drive the movement and self-expression within parameters of set choreography. The class will be infused with my knowledge of anatomy, orthopedics and the study of movement so that I may help others learn about proper alignment, technique and muscle activation. Modifications can also be made to suit specific movement limitations or pain. All in the Front Door Studio, $5/class. Promo: $35 for 10 classes - NEW STUDENTS! Hello! I'd like to tell you a bit about how Zumba has brought me back from disabling pain, and about my class: my personal mission as a Zumba instructor, is to find women who need to heal through dance. After getting rear ended in a car accident 14 years ago, and then developing the chronic pain that was due to fibromyalgia, I went through 8 years of barely tolerable suffering. I was entirely disabled and my body was in atrophy like a little old lady... at 38! There seemed to be no answers in sight. Finally, it was Zumba that gave me my life back, and keeps me going every day. Literally, I could not work or survive without dance. Additionally, know that at Maple Street, we have a community of people who actually CARE about each other. Together, we support one another, and class is usually the highlight of our day, not a yucky gym-like experience where people are elbowing each other for space and indifferent to the individual next to them. Also, if you have a self-managing child who can attend and not be disruptive, they can come for free. Imagine…no worrisome gym germs or extra fees!! Spread the word! My class is focused on: a positive and jovial energy that is very supportive, elegant dance moves, raised arms, core work, and raising your heels, (as opposed to a lot of propulsion…although I do model propulsion, and you are encouraged to go for it if that’s your style!) With these changes, you can still get your heart rate up, burn 600 calories or more and tone, without hurting yourself. Or you can rev it up even more, or slow it down!! (Be certain that I WILL challenge you, no matter how hard or gently you want to push, or what level of fitness you are.) Movement is all I ask! Come muevelo, muevelo with us today! For videos and more information, see sarahsaenz.zumba.com, or contact me anytime at (505) 977-8881! The Suzuki Early Childhood Education (SECE) program is a music and movement class for children ages 0-4 with a parent or guardian, and expecting mothers in their third trimester. The SECE program nurtures the child’s musical development from the very beginning. In the class, we sing traditional children’s folk songs, incorporate movements and musical instruments, and work on important musical skills, such as making a steady beat, producing beautiful tone, and treating the instruments with care. However through this class, children also learn other important skills, such as the ability to focus, fine motor skills, emotional and social skills, character development, and readiness for preschool. One of the key concepts of the program is that the ability of a child develops early. The founder of the Suzuki Method, Dr. Shinichi Suzuki, believed that ability develops from age zero, meaning it is never too early to begin nurturing the ability of a child. In support of Dr. Suzuki’s claims, scientific studies show that the development of a child begins in utero, and learning begins prior to birth. Many of the children who begin SECE in utero or at birth are found to be within the 99th percentile of language development and develop perfect or nearly perfect pitch by the age of 4. Through this program, children are able to socialize with others, have fun with music, and develop a memorable and nurturing bond with their parents. The Suzuki Early Childhood Education program is an incredible opportunity to develop ability in your child from the earliest possible moments. Private Sessions for individuals and groups. For available days and times, and cost, please contact Carolyn. Pre-Ballet 2 continues the playful further introduction of basic Ballet terminology and movement, tap and rhythmic exploration, light tumbling and flexibility, and creative movement, for young dancers, ages 4-6. Needed items for class are leotards and lights for girls, tap shoes, and Ballet shoes. Boys wear sweats, t-shirt, tap shoes, and Ballet or jazz shoes. No equipment is needed on the first class so please feel free to bring your little one to watch and/or participate. Parents are encouraged to stay while their student participates. $15/class or $40 per month. In Hula class with Kellie, you will learn hula technique, both modern and ancient traditional styles, as well as Mele (songs). During this class you will also have an opportunity to learn the traditions and language of the Hawaiian culture. This class is intended for women (Wahine), but men's classes are available as well - please contact Kellie for more information. Kellie is the founder of Ka La Kapu Polynesian Dance School. For more information about Kellie and Hula, please visit her web site! SO SORRY TO SAY, THIS CLASS IS ENDING 3/16. If you are interested in it’s content, please contact Miles to let them know - the class may form again! Looking for somewhere to play in movement? You’ve come to the right place! This class aims to make space for returning to the source: the sheer joy, delight, and fun of moving from within. We’ll draw from contemporary and post-modern approaches to improvisation, build scores, make choreography, experiment with partnering, play with weight sharing, discover through experiential anatomy, and move and be still as our inner impulses move us. Whether you are a mover interested in investing in your personal practice or an experimenter getting to know your body in motion, a seasoned improvisor or new to all these ideas, come re-connect to your curiosity, playfulness, and expressivity, and get to know your movement community! availability of dance and movement classes in Albuquerque (and the world! ), and in hopes that the providers of those opportunities will make time to take part in the fun too, I offer discounted pricing to self-identified movement educators, such as teachers and coaches of dance, yoga, martial arts, circus, somatics, physical education, athletics, zumba, nia, and anatomy, and to dance advocates, such as administrators and staff of dance organizations, professional dancers/performers, social dance organizers, and Albuquerque Dance Exchange members/organizers. I value your work and would love to hear about what you do to help the movement community grow!